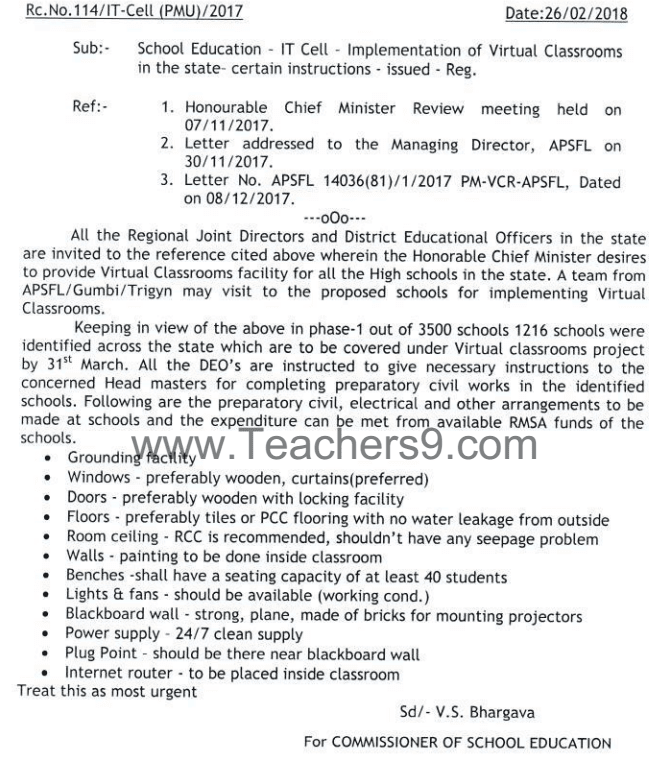 As per Rc.No.114, All the Regional Joint Directors and District Educational Officers in the state are invited to the reference cited above wherein the Honorable Chief Minister desires to provide Virtual Classrooms facility for all the High schools in the state. A team from APSFL/Gumbi/Trigyn may visit the proposed schools for implementing Virtual Classrooms. Keeping in view of the above in phase-1 out of 3500 schools 1216 schools were identified across the state which is to be covered under Virtual classrooms project by 31s" March. All the DEO's are instructed to give necessary instructions to the concerned Headmasters for completing preparatory civil works in the identified schools. Following are the preparatory civil, electrical and other arrangements to be made at schools and the expenditure can be met from available RMSA funds of the schools.